As of March 16th I am now home but I've been very productively putting off writing about how life is strange in the UK or reflecting on my time in Antarctica. So I'm still going to put off writing about that by talking about the journey home. The ship left the Brunt Ice Shelf with all the 2015 winter team and summer crew on the 6th of March, leaving us watching the smoke flares the new team waved from the shore. The first few days where flat as the ship crunched its way through the thin crust of ice starting to build up at the end of the Antarctic summer. Due to good sea ice conditions, and nice weather John, the RRS Ernest Shackleton's captain, decided that the ship should stop in at Signey. This was in part to complete a task they couldn't do earlier in the season but also to give the outgoing winter team a nice view of rocks and mountains for the first time in a while. After this, things got a bit rough. Drake's passage is known as the roughest shipping lane and it showed us why with huge waves, big swell and plenty of people feeling very unwell. I spent about 5 days in bed waiting for the sweet, still waters of the Falklands. On the 13th of March we landed in Stanley in the Falklands, the first civilisation I had seen in some time with shops, restaurants and other people. For many Stanley wouldn't offer much, but when you have had so little for so long , it's a dream! This post is the last of this blog, and this journey, I hope to write about other travels and maybe one day I will get the opportunity to write about Antarctica all over again! This Sunday, the 6th of March, the BBC will be playing one of the programmes they made here, during second call. In this case it's the BBC Radio 4 documentary (here). The episode of Horizon will be shown later this year. update: There is an article on the BBC website about the time they spent at Halley, I make no appearance but the writer is far better at describing the place than I am. After 14 months, 108 days of perpetual night, 155 days of perpetual light, record low temperatures and 1 hour above 0°C it's time to think about going home. As the 2016 Wintering team, our replacements, depart for their "final meal" on the ship, I start my last week on the Brunt Ice Shelf and thus at Halley VI. My work is winding down as my replacement has taken over everything other than some admin and menial tasks and over all I feel I've prepared well for my departure. A Trip to The Crack. Although I have surveyed and studied that crack forming in the ice shelf for a lot of the winter I have never managed to abseil into it. So I decided to take my opportunity to do so the other weekend. Two snow cats travelled over there and ropes were set up so people could abseil into and Jumar out of the crack. The area we went to was called Gate Keeper, a point on the crack where the ice has been forced apart and the cracking is far more pronounced. This seems to be caused by the fact that the crack turns a corner here and heads off in a more easterly direction. I have travelled past it many times in the last 16 months and every time the cliffs, overhangs and broken ice seem more pronounced. Relief, Ships and The BBC. The last month has continued to be frantic and busy with the amount of time before I sail away dwindling. Some time for fun has been found though. Other than regular work on science instruments a lot of time has been spent working on the 2nd relief of the season. The RRS Ernest Shackleton once again returned to the Brunt Ice Shelf and pulled aside at N9 but this time it was a little different to the first. There was far less cargo, but far more people, with a BBC film crew, BAS Scientists and The Director of Science. The BBC crew had arrived to record several pieces about the base including a radio programme, an episode of Horizon and a large amount of content for the BBC website. As you could expect, they wanted to film the experiments while the presenter, an ex-winterer turned weather man, Peter Gibbs spoke to the camera. I've never been involved in filming like this before so spent some time chauffeuring them about the site, ensuring they could film and making sure that the data was minimally affected. Never have I seen the same thing being filmed over and over again so many times. While the ship was waiting for the BBC and other guests to finish their work the outgoing winter team went out for dinner. After a three hour drive we arrived at the RRS Ernest Shackleton. Greeted by the Captain, we where shown our rooms and told that when we where ready we should all go down to the bar for a drink. On the ship there was a beautiful meal put on for us, with T-bone steak, loads of different salads and chips. It was great to be off the base for a meal as a group and everyone enjoyed themselves without needing to, or being able to, worry about work, the base or being ready for an emergency. Flying is always an exciting part of any summer with BAS, but flying to service equipment that is your responsibility is somehow better. For some time now Alex and I have been on "standby" to fly with one hours notice. The flight in question is to go and service Low Power Magnetometers (LPM) at a pair of sites called Condor and Buzzard. These deep field sites are at 85° and 82° respectively. The job itself shouldn't have been too hard, swap out some loggers and maybe dig a hole or two. Leaving the base we flew south over the station, across First Chasm and Second Chasm and over the hinge zone, where the ice flows off the continent and onto the sea. Once we where flying over the mainland the ground features became much less notable with the slowly rolling white ice below us. Our first stop was at Buzzard the simpler of the two visits where Mark, the pilot, trailed the plane's skis and landed a few hundred metres from the LPM. Once the props had stopped we got out and went to do our job. After some quick checks and retrieving the data, we ensured the system was running again and got back into the plane, this time I was up front and after Mark had taken off, I was allowed to fly. The flight from Buzzard to Condor wasn't far and after an hour of flight we completed another field landing and departed from the plane. Condor was the slightly more complex of the LPM jobs mainly because it was starting to get buried. After completing the usual checks we started to plan the raise. This is when we spotted that we would probably have to dig up the wind turbine. The three of us dug taking it in turns going deeper and deeper until finally, Alex found the bottom. After the digging, it was simply a matter of relocating the wind turbine, raising the enclosure and solar panel up on their scaffold, putting in the new logger and flying home. On the way home it was decided that we would take the "scenic route". So Mark few us along the coast, and around to the station, seeing some spectacular views on the way. It was a great opportunity and a good time was had by everyone. The book in question I read some time ago, but after a conversation about it I realised it was about time I wrote about how it affected me to read it here, at the Halley VI research station, Antarctica. The parallels between Mars and a winter in Antarctica are stunning, it's one of the reasons that ESA do so many life science studies here. You're trapped with no chance of assistance, if you're outside and not prepared you will most likely die, your building keeps you alive and without it you would be dead and finally everything relies on you and your team. Reading this book here I found it so easy to associate with the character, both in how he had to work and how he felt. Let's start with how he had to work. As in the book, when things go wrong in unexpected ways you can't just give up, you have to figure out how to solve it, all be it neat or not, and although you have people at the end of the phone giving you help it is in the end down to you. Thankfully, I'm not all alone and we have a range of skills in the team. Sometimes the problems are small, you have ages to plan a response and solve the issue. But, now and again, you have to be ready to respond to a real issue, be it medical, technical or anything else, remember there is no help in space or here in winter. What about how he feels. Now I'll be honest I don't find writing about these things too easy but the roller coaster of emotion felt by Mark in the book rings true. When things are going your way it's stunning. You alone just solved it, in Antarctica. Unfortunately, this isn't always the case, sometimes you fail, sometimes you screw up and the same amount of positive emotion you have for your successes, comes barrelling down on top of you and can, if you're not careful, leave you in a rut. When you alone have to solve this; when you alone have people relying on you; and it goes wrong, that is when it hurts. Comparing the realities of living in a remote, dangerous and unusual environment that our minds and bodies have not evolved to handle, and that of this book, I can only come to one conclusion; mental attitude is more important than anything. You can't give up, you can't stop trying and more than anything else you have to remember that when things go wrong, you fix it, work it out and your next success is only just around the corner. Living in Antarctica is the best thing I have ever done, but it's also the toughest, and don't read this the wrong way, I would recommend it to anyone who wants to come out here. It's Christmas at Halley and, surprise, surprise, it's a white one. With the RRS Ernest Shackleton moored just over 50km away the base is in the middle of its annual relief, with fuel, food and winter fundamentals arriving as well as equipment and new experiments. Unfortunately all that cargo doesn't move itself so Christmas celebrations will have to wait. In the mean time, Merry Christmas from the snowiest place in earth (it's snow all the way down!). The image was taken while driving passengers to the ship on Boxing Day. Over the last year some people reading my blog may have spotted some unusual activities taking place, for example GPS surveys at -35°C in the middle of winter, purposely travelling to some fairly heavily cracked areas and making LOH the highest of priorities. So it's about time I explained why; BAS need to move the base we live in! The huge crack that I surveyed with a number of GPSs is growing at a rate that is faster than in the past, and there is therefore a need to get the building further towards land. Thankfully we have the only relocatable base on skis, but this is still a huge job with masts, towers and science buildings to relocate, using highly specialised vehicles to help pull and lift buildings. Here is a New Scientist article explaining about the need to move the base. I felt surprisingly proud when I read "Gudmundsson will be keeping a close eye on Chasm 1, via satellite images and GPS" and thought "that's my GPS Network". The image is of 1st Chasm at its most open point. It is all systems go here at Halley with more people having flown in from Novo (a Russian base which gets regular flights from Cape Town, SA). Although they were two weeks late due to poor weather, they are now here and working with all the remaining time that they have. The MAC project is now in full force with an extra four people bringing the team up to eight plus air crew. Meanwhile, a survey team has arrived to start analysing the ice sheet for an ongoing project. I'll talk more about next week. For now, everyone is stuck inside, while gale force winds and plenty of snow buffet the building. We are spending our time preparing field kits and writing reports. Tonight is the season's first Science Talk from Tom, the Principal Investigator of the MAC team. Over the last few weeks the base has been ramping up with the arrival of science teams, managers and air crew. Not all of these people are staying long, some like the aircrew simply stayed for a few days on the way to Novo but others like the MAC (Micro-physics of Antarctic Clouds) Science Team will be here for longer. This means that the main module is now at maximum capacity and the summer accommodation had been opened. Yesterday, at 18:30 local time, the first plane of the 2015/16 summer season landed. This marks the end of winter, start of summer and the arrival of new people! It's surprising how you have got used to only seeing the same 12 faces every day, making seeing three different people at once very odd. The first plane carried station management, a vehicle mechanic and a communications officer to help with all the additional flinights this summer. As a group, they have all wintered at Halley VI in the last two seasons, so fitted right in. So that's it Winter 2015 is over, from this point the work load, the number of people on the base and the digging will ramp up and up. The last week, starting on the 19th, was my second winter trip away from the base. This is an opportunity to use the ample light and warm (relative to a few months ago) conditions to get away. Unfortunately our week started with some truly terrible weather. Wind, snow and poor contrast made even the idea of skidooing anywhere an impossibility, you couldn't see a person stood at the bottom of the stairs outside the modules never mind see a snow mound while driving at 20kph (12.5mph). The bright side of this poor weather, which lasted from Sunday to Wednesday, was a relaxing start with lots of lounging around in bed and not having to worry about instruments. Until this week I hadn't realised how much time I spent checking instruments or what a habit it had become, now and again I would realise I had opened the radars data not on purpose but the same way some people open Facebook or Twitter, as an automatic action when the PC is on. Eventually the bad weather cleared and the opportunity to get off base appeared. Seizing the opportunity we headed of to the Windy Bay caboose, the small shelter near the penguin colony which I stayed at back in May. This time there would be daylight leaving plenty of opportunity to visit the penguins, take photos and generally enjoying the environment I have found myself living in for the last year. As we drove to Windy Bay the weather slowly closed in with wind speeds climbing and climbing. By the time we got to the caboose the visibility had closed in and no one wanted to be outside. Putting the cover over the skidoos reminded me of childhood camping holidays as material flapped around in the wind with people sitting on top of it trying to keep it from flying away. Once the skidoos where covered and we had settled into the caboose, with the heating turned right up, we radioed into base for a weather forecast and planned what to do for the rest of the trip. The second day in the field started as a bit of a wash out with more wind and terrible visibility but as the day went on it got better, eventually allowing us to visit the penguins. Once the abseil ropes were set up, we all headed down to the penguins and took photos as we sat still and they walked up to us. These creatures don't see humans, so they don't get scared, really they just want to came and say hello. After several hours watching the colony and photographing the chicks we headed back up the cliffs. On day three we went to the penguins again, this time walking down the newly formed ice ramp, looking at the different sub colonies and heading further "out to sea". We walked out of the bay onto the sea ice so that we could see the ice sheet in both directions reminding us of its pure scale. After several more hours watching penguin chicks and enjoying the surprisingly nice weather, we headed back up the ice ramp and climbed up the last few metres where it hadn't yet formed. That night we planned to head home the next day, drop off gear and then head over to The Rumples for the day. 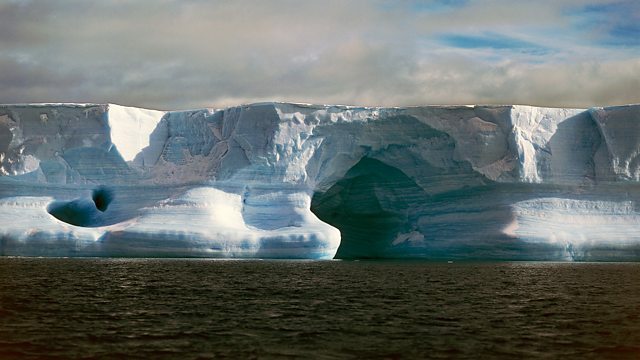 The Rumples are an area in the middle of the ice sheet where a rise in the sea bed is dragging on the ice. This forces the ice up and apart, resulting in huge cracks and ragged ice spikes pointing up into the air. To get into The Rumples Ian, the Base Field Assistant, took us to a route in that he used on an earlier winter trip. After parking the skidoos on the edge of the area we prepared for the two kilometres of holes, hills and chasms that needed to be crossed to reach the summit. Taking with us all the climbing gear we would need to pull someone out of a hole in-case a snow covered chasm opened up underneath someone, we walked into The Rumples and travelled to the top. From there you could see everything, the base, the sea, the sea ice and the ice shelf extending over the continent. It gave an amazing scale to where we are on our giant floating ice cube. Soon summer will really begin, with the first plane planned for the 1st of November and with it the training, maintenance, upgrades and flying that it brings. Over the last month most of my time, energy and thought has focused on the near arrival of summer and the work involved during that time. The first plane arrives soon on the 1st of November and an awful lot of planning is needed for that. Personally this involves ensuring that everything is "shipshape" and some preparation is completed for the summer science projects. Fortunately the weather is also vastly improved, with temperatures up to a roasting -13°C, so time spent outside is very comfortable if you wear the right cloths. Some of the site is starting to be "raised" a process involving getting things up and out of the snow. The amount of daylight is also extending with one of the optical experiments stopping because the sun never goes away always illuminating the sky from below the horizon. Although some of my experiments have stopped others have been "playing up". Both of the radars have had strange events over the last week. MF decided to blow one of its amplifiers, this happens from time to time, so it needed repairing. Superdarn had a mysterious issue involving one if its safety systems stopping it for seemingly no reason. You would think that after running for over forty years, in one form or another, people would have seen all the issues Superdarn can throw at us but she still pulls stunts like this every now and again. Next week I'm away on my winter trip, an opportunity to enjoy a break from work and some stunning views. I hope I'll have some good photos for you when I come back. On Wednesday the weather on the ice shelf started to warm up, enough to ensure that the snowcat could drive to and get back from Windy Bay. This meant a trip to see the penguins. Getting anywhere by snowcat takes a long time, with a maximum speed of 10mph (but with a speedo that goes up to 85mph! ), you just need to be patient. They also take two hours to warm up even when it's only -25°C. This meant a 7:30 start to dig out, warm up and then start the vehicle but by 10:30 we where good to go. Once we had made the long drive to Windy Bay we fired up the reflex heater in a small caboose (aka hut on a sledge) located there and went to set up the climbing gear. As we approached the cliff edge the sound of penguins resonated over the edge, a noise that you can't really describe. So many tweets, flaps and noises that they all merge into one sound like high pitched white noise. The colony is huge, thousands of penguins as far as the eye can see. Standing on the cliff edge really shows you the scale. Once the climbing gear was set up we descended to the sea ice below, with the usual tentative moment as you lean over the edge. Descending down 30m of ice you can see all the layers built up over years and years of snow deposits, leaving lines in the cliff. At the bottom we wandered over to the penguins. At first you can slowly move between them, easily keeping your distance, but soon they become interested and start moving towards you. Eventually we stopped and sat on a large lump of ice where the penguins slowly moved around us. They don't mob you they just slowly move nearer, almost imperceptibly, just a few cm at a time but over the two hours we sat there they got within a metre. Seeing nature on this scale, particularly after not seeing anything alive other than people for the last few months, was great. As we sat looking at the colony we could start to see some chicks still buried under their parents, hiding from the cold and wind. The parents with chicks were deeper within the colony meaning you only caught fleeting glimpses of them as the other birds milled around leaving the occasional gap. After a few hours on the sea ice it was time to head back up to the top of the ice sheet. This is a process I wasn't looking forward to. To get back up you are required to jumar from the ground. Jumaring is a simple process. You have two devices attached to you for climbing up the rope. Slowly lifting all your weight 30m isn't easy, especially when you have to pull yourself up over the lip at the top of the ice cliff. Surprisingly it was easier than I thought it would be. Having practised in the garage on a free rope, just having the ice cliff in front of you made life easier. Once everyone had made it up the cliff we cleared up the gear and started the snowcat (another 2 hour process). I drove back to base in the dark thinking about how great the previous day had been and how I was looking forward to the next adventure... Winter trips! Yesterday at 11:44 the sun's disc was, for the first time in 108 days, visible on the Brunt Ice Shelf. Although the sun should have risen a few days ago, the constant wind, cloud and blowing snow obscured the horizon. Finally, yesterday the sun rose and although there was a small amount of cloud at the horizon, eventually we saw the sun's disc. By John Muir a man who is surprisingly appropriate. He was one of the world's first conservationists, setting up US national parks. The image is part of a time lapse of 2200 photographs taken over two hours as the sun was rising. I haven't been the best at writing in here for the last month, but life has been very busy with darts tournaments, film making and general work. July has been a windy month with 20 knot winds battering the base seeming normal and the whole base rocking about in 40 knot winds is beginning to seem normal as well! Due to the rather unhelpful weather a great deal of my time has been spent indenting all the items belonging to the science team. The indenting process is very tedious but strangely rewarding when you see your completed masterpiece of tidiness and numeration. The month has involved some fun, predominantly more darts against other nations stations as well as Rothera, the British station on the Peninsula. The opportunity to do outdoor activities is also coming back as the sun slowly nears the horizon ready to peak above it on the 12th. I'm looking forward to seeing the sun again as well as a normal day-night cycle. Having enjoyed our week off for Midwinter a week ago, work is back in full swing. Everyone is busy planning for summer, ordering parts for the ship to deliver upon its next visit and doing the normal maintenance jobs. My week has mainly been spent out at the radar cabooses planning the expansion of one of the radars, as well as completing my own regular maintenance tasks. The end of Midwinter was enjoyable, with a Winter Olympics (curling pictured), a bar crawl and a few rounds of crazy golf. For the bar crawl different groups made their own themed bars, these were usually work related. Alex and I made a Vodka Ice Luge which went better than expected... other than a small leak at the seam of one of the ice blocks. A good time was had by all! Midwinter is an important event for everyone in Antarctica, it represents the light starting to come back and the turning point for winter. Our base has the week off (or as "off" as you can be in these circumstances!) but we still have a packed calender of events, fun and presents. One winter tradition is the giving of presents, everyone on the base is allocated another member secretly and we make them a gift. I was allocated Sarah, The Chef, and made her a back lit model of the main "big red" module. Another big event on Midwinters Day is the BBC World Service transmission, This carries messages from loved ones as well as BAS, famous people and The Foreign & Commonwealth Office. We, like many other bases, also watched "The Thing", A classic Antarctic horror film. By far the best bit of mid winter was the food, Sarah made a seven course meal with lobster, spring bock, duck pâté and so much more. The image is of a white aurora this morning. At the end of the week I'll put up an image gallery of all the events. On Thursday a group of people from the base all had work to do at a similar point on the ice sheet. So it was decided that it would be nice to make a day of it and spend a night at the caboose above Windy Bay. We travelled by snowcat rather than the more usual skidoos, mainly due to the warm enclosed cab and the need for some of us to be trained on its operation. Snowcats are best described as a Landrover Defender on four huge caterpillar tracks, with four "track" drive and steering. First stop was the site of Halley V, the predecessor of the current base, to check the LOH site and the weather station. Then we continued along towards the coast raising the flag line as we went. Some of the flags where only a few cm above the ground rather than a metre or more as they should be. After about three hours of travel we made it to the caboose. The first goal was to warm it up, so we lit a few tilly lamps and stoves while Tom serviced the stove. Once we where happy with the caboose we set up sleeping bags, made dinner and played cards. After a while we decided to go outside and look at the stars, when away from the base there is almost no light pollution, so the stars are all visible. While lying out there, we could hear the penguins on the sea ice a few 100m from where we sat. It sounded like white noise, thousands of tweets and clicks. The next day we woke early to warm up the "cat" and then drove back. It was a good trip and although it was a long day and tough work out in the cold, it was nice to be somewhere that wasn't the base. I was recently sent some questions from a school near Crewe in Cheshire and kindly their teacher gave me permission to put the answers on here. If anyone else has questions, feel free to send them, a link is at the bottom of this post. We eat similar food to what you have at home. We have a chef called Sarah and a huge freezer containing every kind of food you can imagine. We got some fresh fruit and vegetables when the station was resupplied in March, but they don’t last forever and we are starting to run out of potatoes and onions now. Thankfully we have a large storeroom with lots of dried and canned food to ensure we have enough to last through to December when the ship returns here with a lot more food. It’s very cold. At the moment it is -30°C about three times colder than your freezer at home. The coldest it has been so far is -39°C. In a normal winter -45°C is not unusual so it is set to get colder yet. The lowest temperature ever recorded here was -55.4°C but we’re hoping it doesn’t get that cold this year. It’s very nice inside the base, the building is kept at 20°C so you can be in a T-Shirt and jeans as long as you stay inside. Going outside requires a lot of clothes though. Here is a picture of me about to go outside to work on one of the science experiments. Do you prefer Antarctica to England? In Antarctica it is exciting as every day has something new, an adventure that you never expected. It also looks like nothing else on earth with miles and miles of ice only broken by huge gaps in it where the ice is moving and tearing apart. The auroras are also something most people don’t get to see. Especially from right underneath them. The UK does have a lot of things that here doesn’t. There are only thirteen people on my base and although they are all great friends I am looking forward to seeing other people in the UK when I get home. I’m also looking forward to seeing trees and other green things. There are no plants here, so I haven’t seen any since I left Cape Town, South Africa in December. Here is a picture I took from a plane travelling to a mountain range about 3 hours away from the base. You can see how big, empty and white this place is. The photo was taken from 10,000ft (3,000m). What types of animal have you seen? When I was on the ship travelling through the sea ice to get here I saw lots of animals. Several kinds of penguins, albatrosses, seals and even a few whales. Lots of people stood right at the front of the ship (called the forecastle) to take pictures, you saw something different every couple of minutes. On Christmas Day the ship stopped and let everyone off to play football on the ice. Lots of penguins came to investigate what was going on, that’s how I got the picture below. Since being on the base there have been fewer animals. There’s very little food for animals when the ground is just ice. Most of them live by the sea and don’t travel inland very regularly. The first of May was the last sun-set, sun-rise or sun-anything I'll see for three months, as Antarctica is plunged into darkness. The days have been getting shorter and shorter for a while now with the onset of the sun setting earlier. This is an important day for Antarctic research stations as they celebrate the last sunset and prepare for the lack of light. At Halley, we decided to make a day of it with the traditional "flag down" ceremony and games outside. The traditional part involves the oldest team member taking down the flag and saying a few words, then champagne on the roof next to the flag. Drinking at -30C has its difficulties, ice forms in the champagne and the glass becomes so solid you stick to it. We decided to have some games too, so we could enjoy the last of the light. We played rounders, put up a slack line and had a three legged race. The base is currently changing, with darkness becoming more prominent and the days getting shorter and shorter. On the first of May the sun will rise for the last time, and although it will glow above the horizon the disc will not be seen for three months. The extended night is good in some ways, auroras are much easier to spot, now that night is 17 hours long. The image above is part of a time lapse of the biggest aurora I have seen so far. The light was all over the sky and changed every time you looked at it. Slowly swirling around the sky, changing colour, intensity and shape. I will try to upload the time lapse at some point. Every member of BAS staff who winters at a base in Antarctica is offered the opportunity to go away for a week, once at the start of winter and once at the end. Last week was my turn to go on a holiday. The plan was to head over to Second Chasm near the hinge zone where the ice flows off the continent and onto the sea causing huge cracks, bulges and crumples. The four of us were planning to do some ice climbing, caving and exploring while we were out there. The first day was mainly travelling from the base out to the camping area. The weather was great and after several hours and about 30km we had made it to a feature commonly known as Aladdin's where we planned to camp. Up went three tents, one for myself and Steve, one for Tom and Ian and a third for "bodily functions". Once camp was set up and everyone had unpacked bags in their tents, we went to scout the local area, ice climbing up the large feature next to us and working out the best way to go along the ridge, to get a good view out across the ice between us and the chasms. The view was spectacular, out across miles of ice hills then on into the flat white area that we see from the base. The next day was clear and wind free but very cold so we decided to go exploring by skidoo. Travelling out to a place called Stonyberg, an ice feature covered in rocks that has either flipped over putting the rocks on the surface or eroded down to the rocks stuck to the bottom of it. Strangely the novelty of seeing stones was quite nice, something different to ice and snow. We then continued on past Stonyberg over towards a large rise with two valleys at either end. Here we went hunting for ice caves. We only found one (pictured on the left below) but it was full of snow and the roof was clearly unstable. As we explored some more, we found a patch of ice at the bottom of a steep slope. It seemed somehow different to the rest, more grey, less pure and white. With a bit of ice axe investigation, a small hole was made and water was found underneath. When I tasted it, it turned out to be salt water. We were standing right at sea level, where the ice sheet dipped down off the land and back up the ice floating on the sea. Day three was a wash out, 30 to 40 knot winds kept us all inside, so we used the opportunity to have a well earned break, sleeping, reading and playing games. The enforced rest was great. You can't help but think about work when living on the base. I managed to finish my book and start the first Terry Pratchet novel. On the Thursday the weather backed off and we decided to make a break for it, leaving in the late afternoon as the sun set and driving back in the dark. As we approached the base it could be seen for miles because it provides the only light on the horizon. When we got into the base in the dark, the rest of the team were sitting in the dining room having just had dinner and we told them of the trip. I got everything out of my trip I could have wanted, ice climbing, exploring the unknown and terrible weather. What more could Antarctica offer! On Tuesday the last plane with Summer staff flew out of Halley on a Basler (pictured) leaving only the Winterers behind in a base that now seems very large and very quiet. Everyone leaving was a very exciting time, we all waved flares and smoke as the plane flew away. Since they left everyone has been tidying the base and sorting out how it will be for winter. We started dealing with the boot room and other areas that never get a chance during summer. This weekend, I was hoping to get some photos outside for a school near home, unfortunately the 38 knot winds are going to stop that! Since the day/night cycle is starting to become more balanced now with about 10 hours of darkness a day, the cold is starting to became much worse, with a huge temperature range between night and day. This causes problems for field work the last of which I have just finished. Yesterday, Nick (one of the two field assistants) and I relocated a GPS station, from near the sea, to across the other side of the ice shelf. This is to help monitor the ice cracks on which we conducted a GPS survey a few weeks ago. This was a huge distance and involved leaving at about 8am. Unfortunately the temperature was -30C, the coldest temperature I've encountered since arriving here. It wasn't much better for the rest of the day with a high of -22C at midday while we ate our lunch. In the last week, my time has been filled mainly in debugging an issue with the SUPERdarn radar. Thankfully when not doing this there has been some fun work to get on with. This year is the first time that BAS has worked with the European Space Agency, ESA, doing research into how people operate in space. The main aim is to provide insight into how people would cope on a space trip to Mars. Halley is a surprisingly good analogue for a interplanetary mission, it is dark for a sustained period, we have a small team (13) who are in relatively close confines and we have a similar range of skills to those that a space based crew may have. Because of this, the Doctor is using us for a series of tests based on how we feel, how we work and how much activity we do as well as one more "special" experiment. The aim of most of these experiments, is to see how the three months of constant darkness affects us. These are starting now, so that we have baseline measurements during the period with both a day and a night. The special experiment is a test of skill degradation. Each member of the station will learn how to operate an ISS docking simulator and then be tested throughout the year on their ability to complete the various docking manoeuvres to assess how we loose our skills. My first go on the simulator was yesterday and it was excellent! I think too much time playing on the Kerbal Space Program may have helped me though. The weather for the last week or so has been excellent, still cold but sunny and relatively wind free. Because of this I've been Skidooing all over the ice shelf visiting science field sites and collecting data for field experiments. The majority of the trips out involved visiting Life Time of Halley (LOH) sites. These are a series of highly accurate survey GPS stations which are located in a ring around Halley and used to detect movement in the ice sheet. This is to both protect the base and to give scientific data about how ice sheets like this one move and develop. The other reason for going off base this week, was to complete a GPS survey on a large chasm that's been developing for several years not too far from the base. It's nothing to worry about and even at its current growth rate it won't be an issue for several years, but BAS like to keep a close eye on it. Over the last week there have only been two days with winds below 20 knots, thankfully we managed to get all the outdoor jobs done. Now, the wind is averaging at 30 knots and gusting up to 36. The plane that came to visit is still waiting to leave, five days after it should have left. With the poor weather, life has slowed down a little from the hectic early summer season. The last week has been spent raising SuperDARN, one of the two atmospheric radars I am tasked with looking after here in Antarctica. Raising is an important element of life here at Halley; as the snow falls, the buildings have to be lifted out of it. That's why the station is on stilts. The SuperDARN raise is quite a time consuming process with sixteen antennas to lift 4.5m. Even with a crane it takes a great deal of manpower and coordination to move them. As I write this, the last antenna has just been finished and next week will be spent re wiring them to the transmitter, then testing that no damage occurred while everything was moved around. When not digging, I have had a bit of time for fun. I was asked to be a co-pilot on a flight out to the Theron Mountains to deliver a field party. The views where amazing, with empty wilderness in every direction then a huge (approximately 1300m) mountain springing out of the snow. When I have a chance I will put up a gallery of photos. On the way back the pilot had some paper work to do and asked if I would mind flying the plane using the training he gave me on the way out. I flew for two hours. It was amazing being allowed to fly a plane at 10000ft across the continent then over the hinge zone where the ice flows off the continent and into the sea. The next week will be busy with 41 radar supports to raise and even more snow to move, on the bright side there is an ice climbing trip this weekend. Having arrived on base last Monday (29th of December 2014), the last week has involved a great deal of hard work getting all of the supplies and equipment off the ship and to the base, 50km inland from where the ship moored up. I've been working on the cargo line taking barrels of Avatar(aviation fuel) and crates of goods and forming neat piles. The base is very nice, none of the images I saw before I got here did it justice. It's much larger inside and the rooms comfortably accommodate many things. I never thought I would fit all my gear in. Merry Christmas and a Happy New Year to everyone. Thank you for my presents. Alex, the other electronic engineer on the Wintering Team has a blog too it is www.alexandicity.com . The image is a Christmas present from my sister. I'm now five days into the voyage across the Southern Ocean on the RRS Ernest Shackleton, and the boat is being set up for Christmas on the high seas. The Christmas trees have been put up (and lashed down to stop them falling over) and the tinsel has been stuck around the lounge. I've never been the best at sea and this voyage hasn't been any different to others I have been on. Thankfully the doctor have given me a patch that goes behind my ear and stops the worst of the symptoms. Currently the officers say that we will reach ice on Sunday (14th of December). As I write this I'm flying at 40,000ft travelling at 570mph on the first leg of my journey to South Africa aboard an Airbus A380. This leg goes to Abu Dhabi, then after a 4 hour wait, the next leg to South Africa will begin. This represents the real start to my Antarctic journey. The problem with leaving for an amazing opportunity like this is having to say goodbye to your friends and family in full knowledge that you will not see them for at least 15 months. See you all in 15 months! The next post should be from the boat some time next week. The last month has been a little slower than the two before it. A lot of people have flown to Antarctica and the RRS James Clarke Ross has set sail with even more people on it, leaving BAS Cambridge big and empty. It has given me a lot of time to work on antenna improvements. It's my turn to go soon though. As I sit writing I'm on my pre-deployment leave back home in Cheshire catching up with friends, family and frantically trying to ensure I have everything I want packed and ready to go. I fly to South Africa on the fifth of December via Abu Dhabi then go on a long voyage aboard the RRS Ernest Shackleton (pictured below) to the Brunt Ice Shelf, where Halley is situated. This will take at least two weeks but could take longer if the sea ice causes the ship to have to wait. The last week and a half have been very strange with a lot of friends from BAS leaving to travel south or starting their pre deployment leave and almost all of my training courses are done. This has given me a chance to start to get my teeth into learning about the science equipment I will be running. Over the last week I have mainly been concentrating on SUPERDarn, a very high power coherent scatter radar capable of measuring ionospheric readings across the Antarctic Continent. I've loved learning about these RF systems after spending two years learning theory at university. It is a great opportunity to apply my knowledge as well as truly understand with practical, real world examples. This week has been spent training at great heights. Monday to Friday was spent working on towers, learning to climb and work safely while up there. The training tower in Cambridge is about 15m high and on day one we just climbed up and down. On day two we worked up there removing a ladder segment, lowering it and reattaching it. The final day of the course was spent doing a rescue on a suspended dummy. The rest of the week has been spent working on cherry pickers. Learning how to safely move, lift and work while inside and outside them. Its been good fun but you are very aware of your precariousness. Norway was a fantastic trip, most of it was spent looking at the Skiymet Radar belonging to NTNU in Trondheim. This radar is very similar to the MF radar at Halley, being built by the same company and operating in a similar frequency range. The place was amazingly beautiful being a city surrounded by mountains and wooded hills on every side bar the north, where there is a fjord (if you want to see its location it is on my travel map). This meant that even when you were in the centre of the city you could see out to hills or open water. I would love to go there for fun, if it wasn't for the costs. Food was at least double what you would expect in the UK and alcohol was about three times as much. If someone wanted to pay for me to go again I wouldn't complain though! For the last ten days the wintering teams have been training in a wide variety of subjects including sea survival, injections, putting up an Antarctic tent, surviving a fall into a crevice, using a spinal board, administering laughing gas and surviving a sinking ship. Quite a lot for a week and a half. The first part of the training was held in Girton College and covered many aspects of the trip to the South Pole from what to do in the event of an oil spill to nearly meeting all the people who are going to winter with me. Having now met and spent time with everyone, I think it should be a good team. The most interesting talk was from ESA about how Halley will be used to test the physical and psychological effects of isolation and loss of the "day-night cycle". The next part was an advanced first aid course. I would like to think my first aid is fairly advanced but it has nothing on this. Inter-muscular injections, cast making and extreme frost injuries were some of the things that were covered that I have never done before. At the end of the course there were actors outside the centre pretending to be injured with blood spurting and badly broken bones, that made the whole thing seem so much more real. At the end of the week in Girton anyone with a remote chance of going on a ship had to complete a PST sea survival course. This involved a morning of power-points and being spoken at about safety equipment and escape systems followed by a fantastic afternoon in a purpose built sea escape simulator. This huge pool with wind, rain and wave machines was terrifying with everyone trying to jump from a 5m board into the pool and scramble into a life raft in the pitch black, only the simulated lightening let you see. That was the best bit of training I think I have ever done. The next few days were spent in the Peak District learning climbing, search, navigation and camping skills. This was a nice break from the heavy learning of the last week and an enjoyable time was had by all. Over this week the meteorology department have been teaching the wintering science staff, of which I am one, to take WMO (world meteorological organisation) SYNOPS reports. These are 3 hourly reports of temperature, wind speed, direction, pressure, cloud type and weather ( which apparently is a separate thing!) as well as an array of other features. This data is fed into the worldwide WMO database and used for research as well as weather forecasting. Never had I dreamed there were so many parameters you could measure, there are 99 types of weather alone, never mind the types of frost (12), clouds (30) and "optical features". All this data is encoded into a comprehensive and thus very tedious coding system and sent back to the met office. I'm enjoying learning about this a surprising amount, as it's a bit of a break from talks about RF systems and why we collect so much data. I will try to write again when I'm back in Cheshire this weekend. The Image shows a sky we assessed through a heavily polarised filter which makes seeing features on the bottom of clouds easier. After finding a source for all this data I now have a statistics page showing weather and wind on the site. You can find it here , as I write it's a nice warm -25 in Antarctica! The last week has been one of the most interesting, worrying and educational of my life. Moving to Cambridge, starting a new (some what unconventional) job and making new friends all comes with a lot of apprehension, but also huge rewards. For those of you who don't know I now have a job working for the British Antarctic Survey as a “Wintering” Electronic Engineer. This is a huge honour, as I found out this week I am potentially the youngest person to ever overwinter at the Halley Research Station, the current youngest was also 22 and checks are being done as to his age when he arrived. The role itself involves maintaining and monitoring science experiments as well as helping with other duties on the base. This week was the start of that adventure and I can say with some confidence that everyone I have met so far has been great and willing to show me what they do, be it science, logistics or engineering. I have held 10,000 (ten thousand) year old ice, had many talks about science systems and have seen the huge numbers of people and logistics that support the bases. I will probably try to write more next week as I now realise how much I have done and how difficult it is to put down in a single go like this.